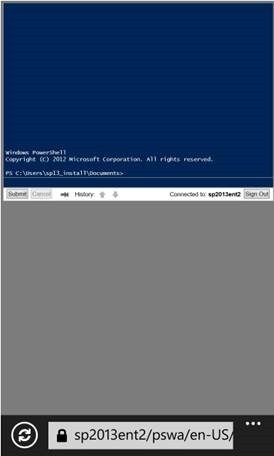 I was even able to login and execute PowerShell Commands from my Nokia Lumia 1020! In my case I didn’t want to install the PSWA application under the Default Web Site. I create a new IIS Web Site Called “PSWA” and assigned it port 8001 to start. Don’t forget to give ‘Everyone’ read access to this site or you may get a 401 error. This is because we have not granted anyone access to this server yet. The Add-PswaAuthorizationRule command comes to the rescue! You can run this command for a specific user or a group of users. Just make sure the ConfigurationName parameter is correct! 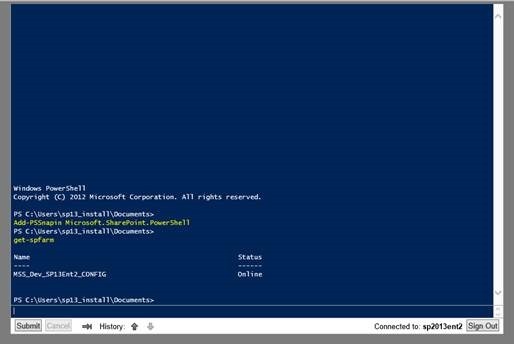 You can create your own session configuration or you can use a built-in one like Microsoft.PowerShell, which gives full access to all cmdlets, modules, and providers. You could essentially create a session configuration for a Server Admin and a SharePoint Admin and give them access to different sets of commands. Again, this is test so I’m giving my user full reigns. You should now be able to login using the forms login screen at https://servername/pswa!